Power producer Calpine Corporation is making a major commitment to alternative energy in California, with a $200 million investment to sustain and expand geothermal generation capacity at The Geysers, the single-largest geothermal operation in the world. For decades, The Geysers geothermal power generation complex in Northern California has been the poster child for both the geothermal energy industry and the renewable energy sector in the Golden State. That reputation now seems secure for the foreseeable future, given the amount of investment being made by the area's primary renewable power producer to increase the long-term productivity of this natural formation. Calpine Corporation is investing more than $200 million over the next five years to sustain and expand geothermal generation capacity, modernize some existing equipment, develop adjacent untapped areas and secure the future of steam generation at The Geysers. The investment will partially result in an additional 80 megawatts (MW) of power coming on stream, which will be a significant contributor to California's plan to obtain 20 percent of its power needs from renewable sources by 2010. Calpine owns 19 of the 22 geothermal units at The Geysers, generating 725 MWs of power on an annual average basis, making the company California's largest renewable energy provider. Calpine's Geysers facilities produce about 20 percent of the state's renewable electrical generation. More specifically, Calpine's new program will include a two-year, multi-rig drilling program to expand steam production to identify new sources of geothermal power. Exploratory wells will drill as deep as 11,000 feet to find new sources of superheated steam. Calpine will also rebuild eight older geothermal turbines to make them more energy-efficient. In addition to bringing more renewable geothermal power on stream, and thus further reducing the state's reliance on power generated from fossil fuels, The Geysers expansion and modernization project will also help to manage two nagging problems. One relates to obtaining an adequate water supply to help maintain and expand the production of superheated steam at The Geysers, and the second relates to the safe disposal of secondary and tertiary treated recycled water from surrounding municipalities. Calpine has been one of many developers of geothermal power at The Geysers over the past several decades, and became the primary power producer at this location through a series of acquisitions in the late 1990s. Over a 10-year span from the late 1980s to the late 1990s, the amount of power generated at The Geysers dropped from about 2,100 MW to only about 1,000 MW. "The reason for that was that although you had this huge heat source, there just wasn't enough liquid down in that rock to transfer that heat into," says Dennis Gilles, Calpine's senior vice-president, Power Generation - Geothermal. "Previous operators were basically depleting that liquid and not replenishing it." What Calpine has done, he says, is devise an extensive program to replenish that liquid, while helping to safely dispose of secondary and tertiary treated recycled water being generated by cities like Santa Rosa. The company started the practice of injecting recycled water from neighboring Lake County in 1997, and expanded it to include Sonoma County in 2003. The recycled water from Santa Rosa is transported along a 41-mile long, four-foot diameter pipeline and is pumped up a mountain to The Geysers through a series of pumping stations. It is then distributed across The Geysers steam fields by a pipeline network, and injected about 10,000 feet deep into the formation through injection wells. Prior to this disposal method, the recycled water, which is essentially drinking water quality, was discharged into the Russian River. Despite the relative cleanliness of the recycled water, local residents still had concerns about any discharges into the river, so this disposal solution and geothermal formation replenishment program was devised. Located about 100 miles north of San Francisco in the Mayacamas Mountains, The Geysers is the single-largest geothermal operation in the world. The area in the United States between the Rocky Mountains and the Pacific Ocean has numerous fault lines due to the colliding of tectonic plates below the earth's surface that not only make the area prone to earthquakes and volcanoes, but also make it fertile ground for locating and exploiting geothermal resources. A geothermal resource is essentially created when water deep below the earth's surface is heated by exposure to hot, porous and permeable rock, resulting in steam or hot water. No two geothermal resources are the same; they often occur at a variety of depths and at different temperatures. Technology has advanced to the point where companies are now able to economically generate power from lower temperature geothermal waters. The Geysers is viewed by the industry as some of the lowest hanging fruit because it produces dry or superheated steam that is easier to use to generate power than lower temperature formations. In the case of lower temperature formations that produce hot water versus steam, heat transfer from the hot water is often used to create a pressurized gas from a liquid that has a lower boiling point than water. That pressurized gas is then used to drive power turbines. These are called binary systems. One advantage of geothermal power versus other renewable energy sources such as solar and wind is its dependability. Unlike these other sources, superheated steam is available around-the-clock. 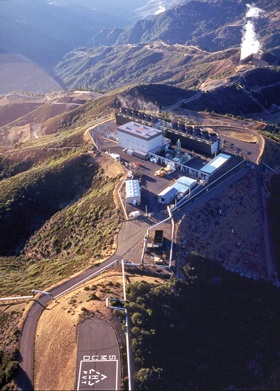 Calpine's power generators at The Geysers operate at about 97 percent availability. A number of projects have been constructed or are in the process of being constructed west of the Rockies, most recently in response to favorable public perception of renewable power, the escalating cost of fossil fuels, and the creation of predictable demand for power generated from renewable sources as a result of government legislation. However, development of The Geysers was first off the block largely as a consequence of the energy crisis that occurred in the United States in the 1970s, and because the formation was large and easier to exploit compared to other known geothermal formations. Investment in renewable power generation continued throughout the 1980s and Calpine generated its first megawatt of geothermal power in 1989 from its ownership of a five percent interest in a smaller plant producing power from The Geysers. It was a qualifying facility under the federal government's Public Utilities Regulatory Policy Act (PURPA) program. PURPA required that existing utilities permit third-party generation of electricity and that the utilities allow online interconnection of electricity generated from these sources to the existing power grid. Calpine's The Geysers facilities produce about 20 percent of California's renewable electrical generation. 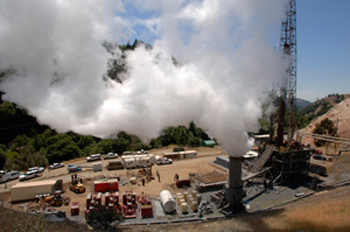 The company owns 19 of the 22 geothermal units at The Geysers, generating 725 MWs of power on an annual average basis. By the 1990s, however, Gilles says there was virtually no growth in the production of power from all renewables. But a couple of recent government initiatives and the rising cost of fossil fuels has raised the profile and current demand for renewable power generation. Those initiatives were the advent of Renewable Portfolio Standards (RPS) legislated by a growing number of states, setting a benchmark for renewable power production in many of those jurisdictions by a defined time period. The first initiative was that many existing utilities are now required to provide a percentage of their power from renewable energy, which increases the demand for power generated from renewable sources. At present, about half of the states in the U.S. have Renewable Portfolio Standards. Secondly, the production tax credit was extended from just wind power generation to all renewable energy producers in 2004, which made production of renewable power from other sources more competitive with wind power and fossil fuels. Calpine's North Geysers Development Program is an example of the cautious approach the company is taking to further develop this resource, says Gilles. That's because although The Geysers is not believed to be fully developed, there is no technology currently in existence to indicate just how large the formation is. So the company is expanding in increments to test its limits because each exploratory drill hole costs in the neighborhood of $3 million to $5 million. The entire North Geysers program is tied in, starting with pumping more recycled water to the site and injecting it to depths of up to 11,000 feet to ensure that the integrity of the formation's steam generating potential is maintained. Calpine is replacing some steam path infrastructure and re-powering eight turbines that are situated adjacent to the expansion area in anticipation of additional steam generation. The turbines were installed in the mid-1970s and have exceeded their design life. Re-powering and refurbishing these turbines is expected to give them a new 30-year lifespan. "The technology has improved to where we are able to modify the steam paths to get improved efficiency in the utilization of the same amount of steam," says Gilles. "As we expand in that area and we develop more steam, what we are doing is changing out the entire steam path." He says both the steam path and refurbished turbines will be better suited and better matched for the steam conditions they will encounter, thus creating the potential for additional power generation from The Geysers.